More of that “here’s how it happened” style evidence/explanation/chemistry re: panspermia. Anyway…what someone figured out *this time* is that certain basic compounds, when exposed to various other compounds and/or heat/light combinations, create other compounds than allow for the basic coding of genetic information. What we have *here* specifically, is an actual compound that works as the pre-cursor, which they have previously been trying to to match to other known compounds (which failed). Now there is a “intermediate molecule” that acts as the stepping stone to the RNA model without the need for separate “sugar” and “base” molecules. Great stuff, and hopefully in school in 20 years, the first five years of science in school will be a long, empirical and experimental proof on how life came into being (and curiously without the need for a supernatural being, just a series of chemical reactions over *to those students* an impossibly long time). Researchers are nearing a better understanding of the chemical reactions that created life on the young planet. Vacuum (imposing extreme dehydration) and solar/galactic cosmic radiation prevent survival of most organisms in space . Only anhydrobiotic organisms, which have evolved adaptations to survive more or less complete desiccation, have a potential to survive space vacuum, and few organisms can stand the unfiltered solar radiation in space. 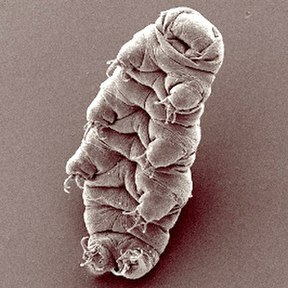 Tardigrades, commonly known as water-bears, are among the most desiccation and radiation-tolerant animals and have been shown to survive extreme levels of ionizing radiation [2, 3, 4]. Here, we show that tardigrades are also able to survive space vacuum without loss in survival, and that some specimens even recovered after combined exposure to space vacuum and solar radiation. These results add the first animal to the exclusive and short list of organisms that have survived such exposure. Current Biology — Jönsson et al..
Water-bears can be seen here. I covered a bit of the concept of “Panspermia” in my Spore review. This looks like a possible culprit, as the dang things can surive /scary voice/ the vacuum of spaaace1! /scary voice/.